Green lipped mussels (GLMs) are mussels that can only be found off the coast of New Zealand. They’re a natural joint health supplement for dogs (AND us humans, too!). They can be fed whole, either raw, air-dried, dehydrated or as a powder. I started adding air-dried and dehydrated green lipped mussels to Missy’s & Buzz’s diet back in 2016. Neither of them had joint issues, but I figured it’d be a good preventative measure to help keep arthritis as far away as possible. 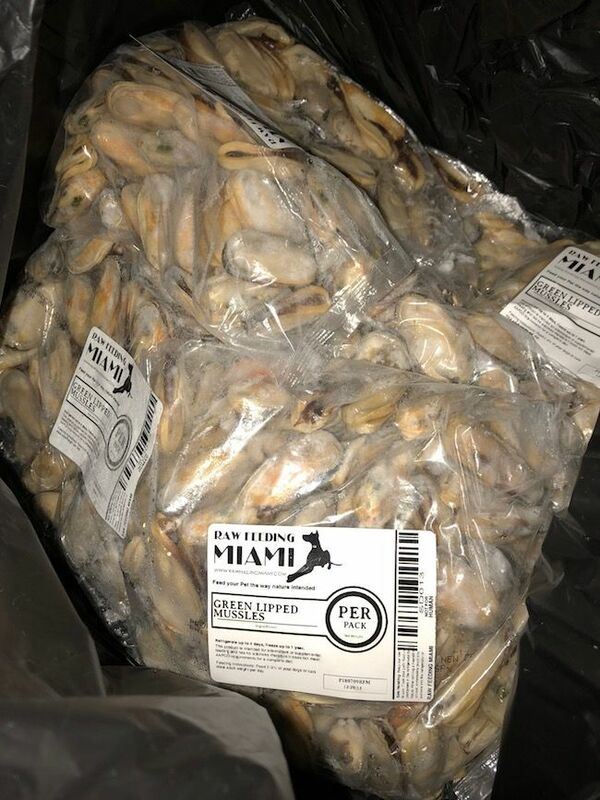 I hadn’t been able to find a raw source of green lipped mussels, so when I noticed that Raw Feeding Miami (RFM) started carrying them recently AND had them on sale, I couldn’t help but place an order. They came in six 2.2 lb bags totaling 13.2 lbs and arrived frozen, as usual when I order cuts of raw meat from RFM. Each bag ended up being $8.80 instead of $10.80. It’s kind of funny that I went ahead and ordered them when you think about it since I’m technically dog-less right now. Raw GLMs are a little tricky to find, so I’ll just be freezing the vast majority of these babies until the day I’ll be an active raw feeder again. I’ll share a few with my friend’s golden retriever Lucy in the meantime. She’s seven and is starting to move a little slower. All of these make them a great anti-inflammatory food that alleviates joint pain, promotes skin & coat health, as well as brain function. Green lipped mussels can either be fed raw, air-dried or dehydrated. I personally have purchased air-dried ones from Real Pet Box and dehydrated ones from Boo Boo’s Best. Missy & Buzz loved both options. I also noticed that The Honest Kitchen started selling dehydrated green lipped mussels, and I’m sure there’s probably a few other brands that carry them as well. 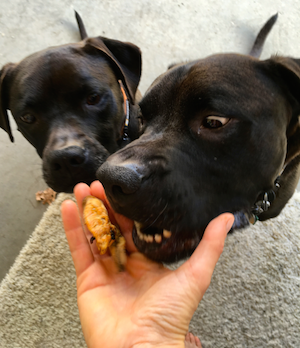 It’s up to you whether you want to feed a whole dehydrated mussel as a treat or top your pup’s food with one or two (depending on your dog’s size). Dogs over 50 lbs can have 1 mussel per day. Those weighing less are fine with half a mussel or a smaller one. The ones I bought from Raw Feeding Miami do vary in size. I’ve seen GLM Powder on Amazon, but I was never able to find one that truly only consisted of GLMs. There was always some other ingredient(s), so I simply crushed some dehydrated GLMs from Boo Boo’s Best to create my very own powder. I sprinkled it on top of Missy’s & Buzz’s raw meals and also added it to whatever filling I came up with for our KONGs (hollow dog toys that can be used as a food puzzle). The dehydrated mussels are fairly tough as far as their consistency is concerned. 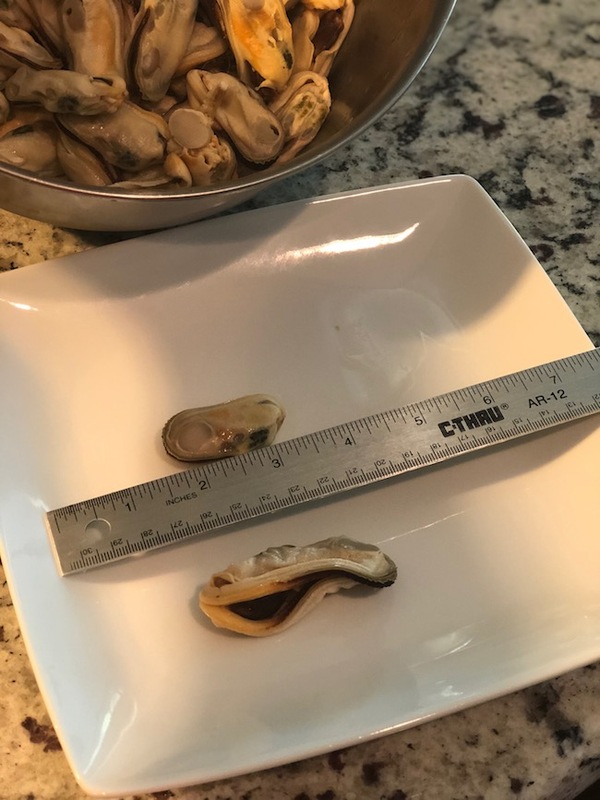 They don’t break apart easily, which is why I’d recommend feeding smaller dogs fresh mussels that have been cut up into smaller bites. You could also crush dehydrated mussels into a powder. Raw GLMs can easily be cut into smaller pieces, and don’t come with a strong fishy odor. You could always wear disposable gloves when handling them if you’re not crazy about touching seafood. I personally like seafood and got used to handling raw animal parts when preparing Missy & Buzz’s raw meals, so I never wore gloves. I did, however, make sure to thoroughly wash my hands with hot water & soap and wipe down all surfaces that came in contact with the raw food. You know, just like I would when handling raw meat for myself. A word of caution – don’t feed your dog GLMs if he or she is allergic to shellfish. You can find out which food sources your dog does poorly on by taking a simple test. Your vet might offer one, and there are also several different tests available online. I wrote a promotional blog post for a company called Pet Medella that offers so called “bioenergetic scans.” I found out that Missy didn’t do well on lamb. All I had to do was to send in a saliva and hair sample. The price tag is $150, although it was free for us in return for blogging about it. 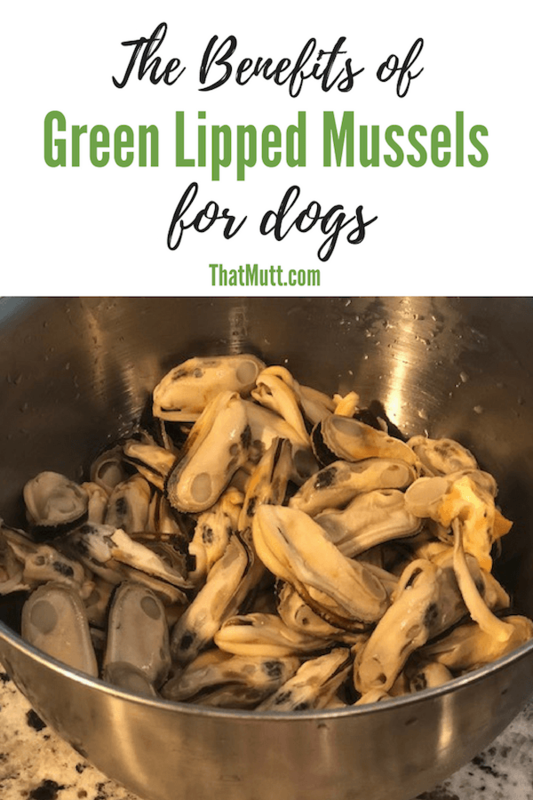 Do you think your dog could your dog benefit from green lipped mussels? Let us know in the comments! Also, let us know if you have any questions. I got some GLM powder on Amazon, it was Snouts brand, and I get dried from Only Natural pet and get their tripe niblets too. Because I like lots of variety I also give oysters, sardines, canned salmon, and frozen mussels too. According to the article I should only give 1 a day to a large dog, is there possibility of overdose? They might get one or two a day but when it’s gone they may not get more than some powder twice a week. I also got the Snouts brand from Amazon! I found that dog nutritionist Rodney Habib recommends 15 mg/1 lb of dog weight per day, which isn’t a whole lot, so I’ve been applying that formula when feeding GLMs.